Would you like to make a positive impact which will enhance, not only your child’s sporting experience, but the rest of our community’s valued youth as well? JCC Chai Sports is looking for coaches for all of our leagues and programs. Whether a Parent Volunteer or a Rep coach, each coach has a tremendous impact on the experience of each team and player. The success of most programs are a direct result of dedicated, exuberant and positive coaches. This year, we are going to be offering special incentives for all volunteer house league and introductory coaches (non-hockey). Below you will see detailed information on our model, your role and the many exciting benefits you will get as a JCC Chai Sports Coach. To officially register as a coach, and receive the benefits that go with it, please click here and email our Assistant Director Jeremy Blustein. We believe that we offer an advantage and a bonus from other leagues/programs, with the use of our Technical Instructors or Conveners. We feel, that although players are only meant to learn the basics of soccer development in a house league setting, they are best doing so through trained, certified and experienced individuals. Or coaches have the advantage of being able to work in unison with a fully trained staff member should they require any assistance at the field. 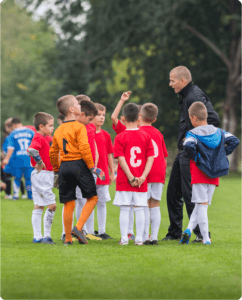 Even with these instructors overseeing the programs or in some cases running the drills in practice, the role of a Parent Coach is integral to the success of these programs. Programs and leagues cannot run without the guidance of a dedicated Parent coach.Teams that have a committed coach, are well run, organized and are usually having a lot of fun. This season, it is mandatory for every team to have a Parent Head Coach and Assistant Coach. All coaches will be trained on both our off the field standards and on field technical training before the season. You will be given detailed and easy to use weekly lesson plans for the entire season. In many cases, we will also locate courses and enable head coaches to get official credentials from the OSA, OBA, etc. We will send you the contact information for each player from your team, and communicate your position to parents and players. We will host an end of season exclusive coaches & family party. Head coach will get will get a coaching kit, including shirt, hat, whistle and first aid kit. Head coach will get a coaching plaque with a team photo. Coaches are the personal connection to the players and parents. Ensure that players who are unable to attend, notify you prior to the game. During practice, make sure kids are present, organized, and attentive. Depending on program, run practice using the existing lesson plans. Hand out all uniforms prior to the season. Create snack and beverage schedule. During game, ensure kids are hydrated, substituting regularly and being team players. Be enthusiastic and encouraging during sessions. Be the liaison to the league, regarding rules, code of conduct, balancing teams. Opportunity to join our soccer advisory board and have a direct input on the state of soccer in our community as well as future developments. Their main task is to supervise the programs on the field to ensure coaches are all implementing the proper curriculum and the kids are having fun. Help create a safe environment for the kids. Help coaches set up equipment, nets, pylons, etc., at the field. Clearly communicate to the players before the session begins, saying their name and what the session will be focusing on. In certain programs, run the drills, games and all development training with the assistance of the Parent Coaches. Stop time for regular water breaks, especially on hot days. Cancel sessions during inclement weather. Referee during the actual games. Ensure players are active regardless of how many players are present. Ensure our zero tolerance policy is kept for both players and parents. Report any on field incidents to the technical director or management.